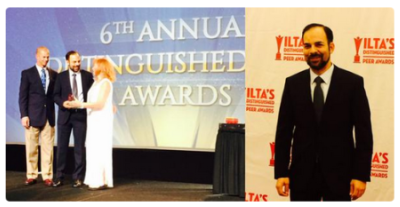 Acknowledging the conflicts-like irony of taking a moment to self-report, I’m pleased to note that I was honored as the recipient of ILTA’s 2015 Distinguished Peer Award in the category of Vendor Thought Leader of the Year. "I’m delighted to congratulate Dan Bressler of Intapp for being honored with the ILTA Distinguished Peer Award for Vendor Thought Leader of the Year." "This award recognizes an exceptional individual who maximizes the value of technology in support of the legal profession, provides quality educational opportunities for ILTA members and ongoing learning to help organizations navigate a complex and changing environment." "Dan has made an outstanding contribution to the community, and I applaud his hard work, dedication and vision." Having been nominated by a kind soul, I was fortunate to have several members of the legal community from ranks including lawyers, IT leaders, risk leaders and insurance providers put in good words on my behalf as part of the application process. For more information, see the formal announcement. Pro Bono Publico, Pro Conflicts?